Resources to aid you — without conflict! Good health is about freedom and power. As a freedom-loving being, you won't get very far for very long by following any program that feels too restrictive. As an inherently powerful being, you won't thrive in a system that requires you to ignore your own inner wisdom or feel that you are a mere victim in a dangerous world. In this section you'll find programs and products I've developed to assist you in increasing your vitality and health as you increase your experience of inner freedom and power. with any health problem, or with anything causing you stress. Be the master of your own wellness. This interactive course is the culmination of my 35 years of experience helping people to be well. You'll be guided through 12 stages of healing, plus piles of skills so you'll have the tools to get well and stay well, no matter what your starting point. Join all those who have already experienced miracles, and get going on your own. Click here to learn more, and join the course! There's NO WORK TO DO in this very practical "use it now" audio program. 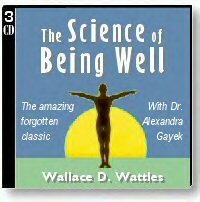 Just listen whenever you like to immediately apply The Science of Being Well in your life and to start seeing and feeling results in your health and well-being. Change effortlessly as you listen to my words recorded with the transformative audio technology of Holosync®. Click here to read all about this exciting program! And click here to learn more about Holosync® (on this page). Keep your faith and focus on health strong and positive by regularly listening to the powerful message of The Science of Being Well on CDs, Cassette tapes, or MP3s. In this section are the very best of the other resources I've used myself to get results using the universal law of attraction principles underlying the Science of Being Well's powerful mind-body approach to wellness. If you could use a good dose of inspiration, check out these amazing stories of healing. You're about to meet a man who stands on five thousand years of experience, with MILLIONS of successes, many confirmed by modern medical research, and teaches something VERY similar to SOBW. Then, get off your duff and get moving with this easy, feel-good way of practicing almost everything Mr. Wattles teaches -- in just a few minutes each day. Click here to be inspired and learn more. The benefits of meditation include everything from just having a break from your stress to complete healing of everything in your body and life. This beautiful program is unequalled by anything else I've ever encountered in 30 years of devoted spiritual practice. All you have to do is sit quietly and listen as Jeddah Mali teaches you everything you need to know, then guides you through an exquisite series of life-changing meditations. 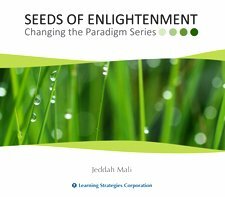 I can't recommend Seeds of Enlightenment highly enough! (If you couldn't tell, that was a long, happy sigh.) How'd you like to experience that relaxed, centered feeling more often? I'm just as pleased as I could be to introduce you to this beautifully written -- by one of my favorite people in the whole world -- collection of wonderfully easy techniques that work so well you'll feel peaceful just reading them -- even before you set aside time to "practice" them. The understated title of this gem, "Simply Serene, 4 Amazingly Powerful Ways to Be Instantly Alert and At Peace," doesn't hint at the dozens of tools beyond the basic four. It's more like a whole course than an ebook, yet you can read it in just a couple of delightful hours. You'll be back again and again for more. Click here to get this wonderful new program and some surprise bonuses! This program teaches you a simple but profound way of dealing consciously with emotions. It’s all about learning how to let go of every kind of emotion  both the ones we cling to and want to have forever (like being in love), and the ones we don’t enjoy (like anger and fear). That last part may sound strange, but the result is a greater peace and greater happiness that spreads into every area of your life. You’ll find the convincing scientific studies on their website, but here’s just one personal example: I was concerned about launching this site because I was very attached to sugar, which was obviously making my body unhappy, and I didn’t want to be a hypocrite, telling you to eat only what your body thrives on while doing the opposite myself. A completely unexpected  and EFFORTLESS  result of using the Sedona Method® was my release of this addiction. I can’t begin to tell you how powerful the impact of this shift has been! What I have learned is that the real issue was emotional, and shifting that emotional pattern that was affecting every area of my life  work, relationships, self esteem, taking responsibility for my actions instead of feeling like a victim  has had the natural result of indifference to sugar. Up ’til now I’d never thought I’d be able to pass by free samples of sweets without a second thought! You can get a free DVD, CD, and MP3 that explains the method and actually lets you try it out. Click here to see if The Sedona Method™ is a fit for you, too. Feel good first, then solve your problems! What a great idea! 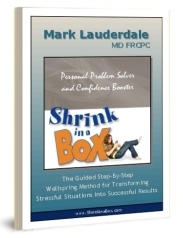 This easy, step-by-step, interactive program, guided by the gentle, experienced, and skillful Dr. Mark Lauderdale teaches you a very useful technique that you can use over and over again to feel better and break ANY problem down to manageable bits. With "The Wellspring Method," you'll find yourself returning to your natural calm, confident, resourceful state with ease, then be amazed at how easily you can find solutions and actually resolve the toughest, most persistent problems. It's available on DVD and CDs as "Shrink in a Box," and comes with a step-by-step manual. Click here to check out the program and get the bonus, "5 Powerful Principles for Personal Success." 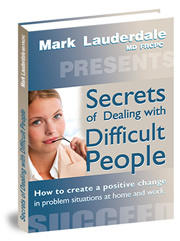 Dr. Lauderdale's new book teaches you brilliant, straightforward skills for dealing with people you find stressful. You'll find yourself nodding in recognition of those troublesome folks--your spouse, family members, co-workers, bosses--in the plentiful storeis and examples. And you'll filnd yourself using and re-using this practical guide to transforming those relationships from sources of stress (and reasons for your health to suffer) to ease. Click Here to learn how to Deal with Difficult People effectively. Bill Harris has a much better description of the program on his website, but what I can tell you is that after using his Holosync® audio program for about six months, I feel like I've been rewired. And that's good! It all works subconsciously. The main difference for me is the background level of peace and patience I feel. I'm more centered, focused and efficient, and have an easier time getting things done — things I used to avoid, like taxes, bookkeeping, paperwork, and the like. Tasks that seemed loathsome before are no longer a big deal. Click here to learn more about Holosync®. Click here to learn more about the Science of Being Well Infinite Coach™ Audio Set.